At BREK Communications, we are experts in telephone, IP, and security systems and related services. We have over 25 years of experience providing businesses in Garden Grove and throughout Southern California a full range of quality, cost-competitive services, including design, configuration, installation, upgrades, integration, maintenance, repair, training, and support. We can help you streamline your processes and cut costs, and our rates are typically about 30% less than those charged by your cable or phone provider. Our expert technicians perform high quality installations, upgrades, repairs, and more on all kinds of security and communication systems. We can even integrate your systems for increased efficiency and cost savings. We also provide comprehensive technical support 24 hours a day, 7 days a week, 365 days a year. All repairs are backed by our no-risk, 100% satisfaction guarantee. We offer free site surveys and estimates in Garden Grove for all our services; call us today to schedule yours. You can rely on our experience and expertise; BREK Communications is truly Garden Grove's best value in high quality security and communication system solutions. At BREK Communications, we implement multi-vendor infrastructure solutions that resolve IT challenges facing small- to medium-sized businesses in Garden Grove, and throughout Southern California. By integrating voice and data applications, servers, workstations, and networks into one powerful infrastructure, we can help your Garden Grove business run more efficiently and save money. We leverage the latest technology in order to provide you with the service levels and functionality you need to successfully run and scale your business, helping you streamline processes and control costs. 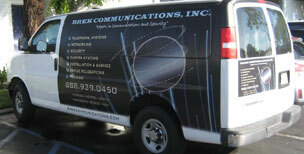 BREK Communications is Garden Grove's best value for high quality security systems and related services. We offer the top brands in security at affordable prices, including Ademco, Bosch, Honeywell, Northern, and more. Our cost-effective services include installation, upgrades, integration, programming, training, repair, and technical support. We monitor our state-of-the-art security systems through UL-approved monitoring centers, and we provide prompt police, medical, or fire dispatch service in the case of a burglary or other emergency. BREK Communications offers a full range of expert, affordable telephone system services to Garden Grove. We can design a cost-effective telephone system that is customized for your business's needs and budget, and we provide comprehensive training and support with every installation. By integrating your different communications systems into a new telephone system network, we can help your company function more efficiently and cut costs. We can also troubleshoot and repair a full range of problems for existing telephone systems; the experienced technicians at our in-house repair lab fix products and systems from almost any manufacturer for the most competitive rates. All telephone system installations and repairs come with a comprehensive warranty, and our repairs are backed by a risk-free, 100% guarantee. The value to any business of an intelligent, comprehensive security system and an efficient, reliable communication system may seem obvious; one protects your assets, and the other makes daily operations more convenient and helps your business run more smoothly. But the value of reliable service goes beyond these benefits. When you hire an expert contractor like BREK Communications, you receive dependable, high quality service without any hiccups, saving your business time and money. We also have the experience and expertise necessary to optimize the efficiency of your systems, making your business operations more streamlined and cost-effective. In fact, the savings your business earns from increased efficiency can pay for the cost of your new system and related services in the long run. Call BREK Communications today to schedule your free site survey and estimate in Garden Grove, and find out what we can do for your business. I evaluate a work team by how they interact with each other and you guys are focused and committed to doing the highest quality work down to the smallest detail. I enjoy working with BREK Communications and look forward to many more jobs this year and beyond. What a great job! What was created, set-up, taught and the hands-on training was just right. Everyone involved spoke highly of your company and the attention to details was beyond my satisfaction. I just wanted to say thank you for helping us with our phone and data problem. The guys did a great job; we had the phones and internet back up and running in no time.